Ring Size Adjusters 14k Yellow Gold Filled Large – For Men’s Wide Rings 12 pieces | QTE No | QTE North America, Inc.
LARGE (giant): for wide men's rings, large class rings, or to join a wedding band with an engagement ring. A jeweler can probably tell you what size you need for your ring. The assortment is perfect for those who prefer to figure things out themselves. 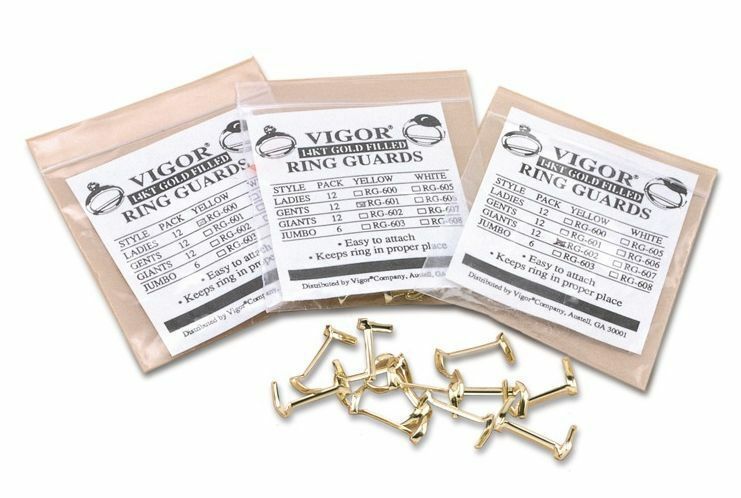 These are the same ring guards used by professional jewelers for temporary ring size adjustment, or when cutting and resizing your ring is not desirable. If our 14k yellow gold ring guards are more yellow than your ring, then your ring might only be 12k or 10k with less gold in it. Refer to our article on the colors of gold for more information. Ring guards are easy to attach and won't slip off, helping to keep your ring in place. There are no sharp edges to tear your clothing or scratch your skin. See our knowledge base for written and pictorial instructions for installing ring guards.